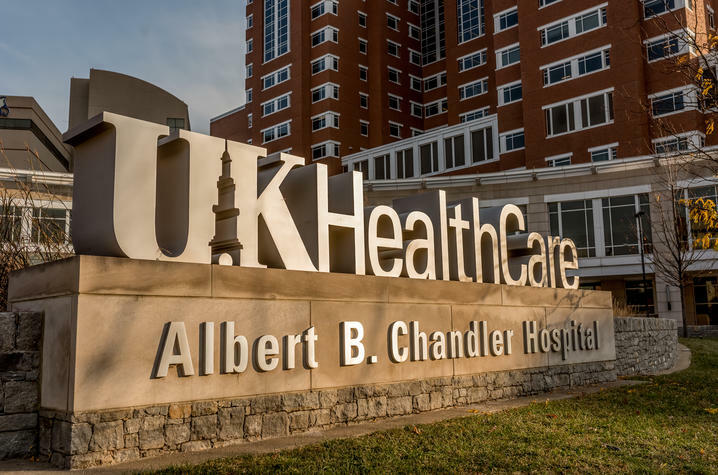 LEXINGTON, Ky. (Aug. 14, 2018) — UK HealthCare’s University of Kentucky Albert B. Chandler Hospital remains the No. 1 hospital in Kentucky and the Bluegrass Region for the third consecutive year, according to the 2018 U.S. News & World Report's Best Hospitals Rankings released today. In addition, four major health care areas have achieved Top 50 national rankings. UK HealthCare national rankings include 33rd in Diabetes and Endocrinology, 38th in Cancer and 45th in both Ear, Nose and Throat and Orthopaedics. Along with the Top 50 rankings, UK HealthCare is ranked as high-performing in five other adult specialties – Geriatrics; Nephrology; Neurology and Neurosurgery; Pulmonology; and Urology. Additionally, the health care system was designated high performing in six common adult procedures and conditions: Heart Bypass Surgery, Heart Failure, Colon Cancer Surgery, Hip Replacement, Knee Replacement and Lung Cancer Surgery. As many patients in across Kentucky struggle with the most complex health issues, these recognitions reaffirm UK HealthCare's role as the academic medical center uniquely qualified to address our state's extensive health needs, said Dr. Mark F. Newman, University of Kentucky executive vice president for health affairs. "In acknowledging our national rankings and achievements, one common factor to our success is the people who work here," he said. "These rankings and recognitions are a testament to the dedication of everyone at UK HealthCare and their commitment to continuously improving quality and service provided to our patients." Cancer care was included in the Top 50 for the second year in a row — although it has consistently been designated as High Performing for many years. This year's significant move from 50th to 38th is indicative of the Markey Cancer Center's continued emphasis on providing exemplary care as Kentucky's only National Cancer Institute-designated center. "More than 50 percent of our patients come from Eastern Kentucky and Appalachia where we have the highest cancer rates in the country," said Dr. Mark Evers, director of the UK Markey Cancer Center. "With this ranking and our NCI-designation, this puts us on par with the top major cancer centers in the country and our patients should feel comfortable that they don't need to go anywhere else to receive the highest quality care." This year's rankings also included the second year in a row that UK's diabetes and endocrinology program has been named a Top 50 program and it increased its ranking from 37th in the country to 33rd, a testament to both the clinical care and research at UK's Barnstable-Brown Diabetes Center. "Diabetes and endocrine disorders are complex diseases that affect the whole body and it is important to receive care at a place like UK's Barnstable-Brown Diabetes Center where our team can provide the comprehensive needs of all our patients in one place," said Dr. John Fowlkes, Director of the Barnstable Brown Diabetes Center. The collaboration and patient-centered care offered at the Barnstable Brown Diabetes Center provides care throughout their lifespan and for all aspects of the patient’s health, added Dr. Kristen Stakelin, Clinical Medical Director at BBDC. UK's Department of Otolaryngology, Head and Neck Surgery, also known as ENT (ear, nose and throat) is the 45th ranked program in the country. The program addresses all facets of the medical and surgical care of the ear, nose and throat region, said Dr. Raleigh Jones, chair of the department. "Our team of physicians and nurses have always worked hard to provide excellent care and this ranking is recognition that our hard work is paying off," he said. Also ranked 45th, is the Department of Orthopaedic Surgery and Sports Medicine where specialists and fellowship-trained surgeons are world-renowned for developing and implementing state-of-the-art techniques to diagnose and treat bone and joint disorders. "I think the success of orthopaedics is based on the whole system that we have at the University," said Dr. Jeffrey Selby, acting chair of the department. "We have a team that's looking for ways to treat patients better every day." For nearly 30 years, U.S. News has strived to make hospital quality more transparent to health care consumers nationwide, said Ben Harder, managing editor and chief of health analysis at U.S. News. "By providing the most comprehensive data available, we give patients and their physicians' information to support their search for the best care across a range of specialties."